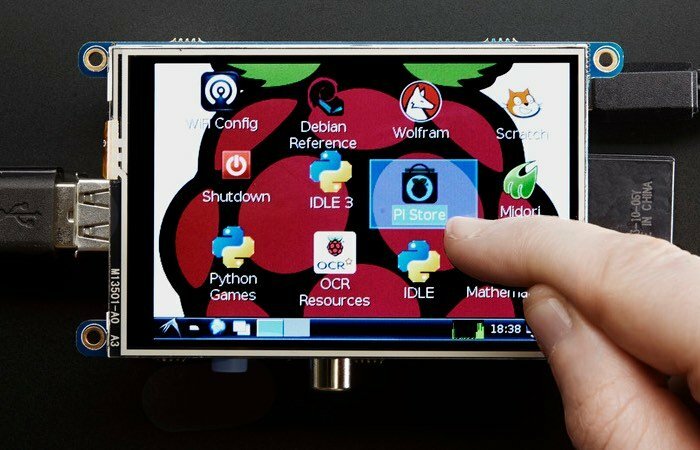 With the launch of the new $35 Raspberry Pi 3 mini PC last month, as well as the launch of the tiny $5 Raspberry Pi Zero late last year and the official Raspberry Pi 7 inch touchscreen in 2015 and a wealth of Raspberry Pi displays to choose from, there has never been a better time to start programming and create DIY projects using the awesome Raspberry Pi range of pocket computers. If you are starting out in the world of Pi you may be a little bewildered by the number of HATs, Shields and small displays that are available, offering a wide variety of different formats and styles. 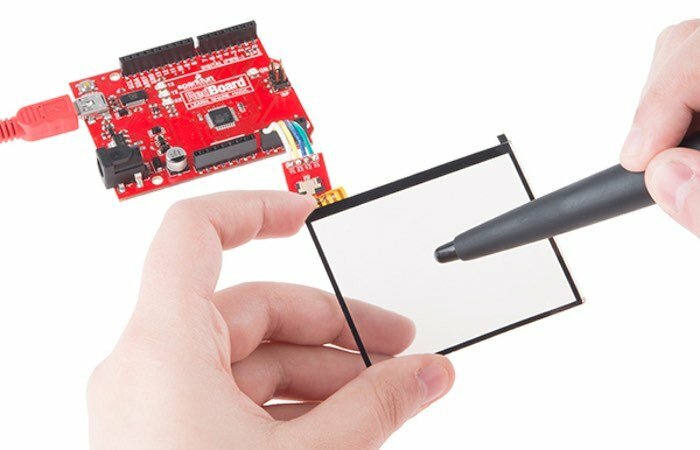 If you have already programmed Arduino, Beaglebone or similar development boards you may have already come across Shields, Capes or Wings, which come in the form of small add-on boards that can be easily fitted to your development board, mini PC or micro controller to quickly add extra functionality. In a nutshell a HAT is a rectangular board (65x56mm) that has four mounting holes in the (nicely rounded) corners that align with the mounting holes on the B+, has a 40W GPIO header and supports the special auto configuration system that allows automatic GPIO setup and driver setup. The automatic configuration is achieved using 2 dedicated pins (ID_SD and ID_SC) on the 40W B+ GPIO header that are reserved for an I2C EEPROM. The EEPROM holds the board manufacturer information, GPIO setup and a thing called a ‘device tree‘ fragment – basically a description of the attached hardware that allows Linux to automatically load the required drivers. What we are not doing with HATs is forcing people to adopt our specification. But you can only call something a HAT if it follows the spec. Below are listed a variety of different Raspberry Pi HATS, Shields and a few smaller Raspberry Pi displays that provide an easy way to add a visual monitor or screen to your project when space or power may be an issue and a larger HDMI connected desktop screens are not required. 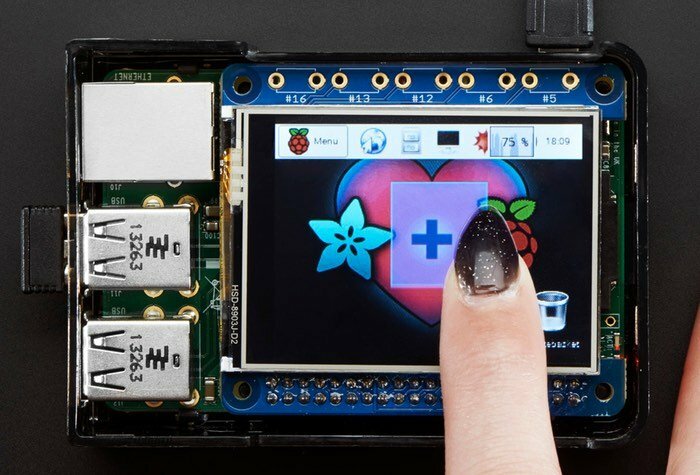 Things to keep in mind when choosing a small screen for your Raspberry Pi display project are the power consumption it will require, does it need touchscreen support and also whether the screen’s resolution needs to be high or in full colour. 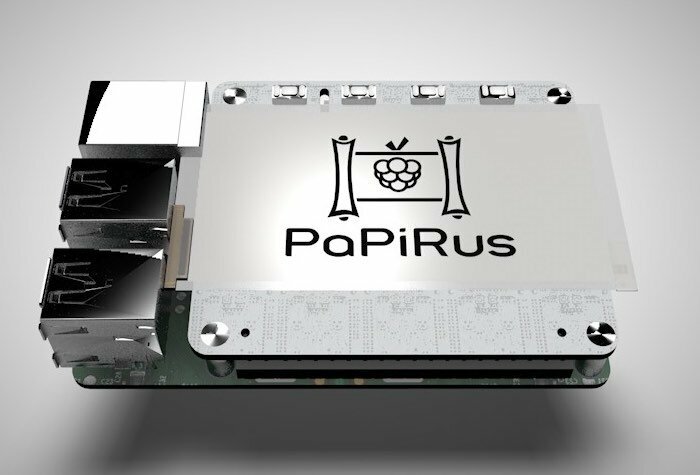 Starting off the list is a relatively new comers to the Raspberry Pi display HAT market and takes the form of a display that was launched via Kickstarter called the PaPiRus ePaper or eInk screen Raspberry Pi display HAT that provides the added bonus of low power consumption. 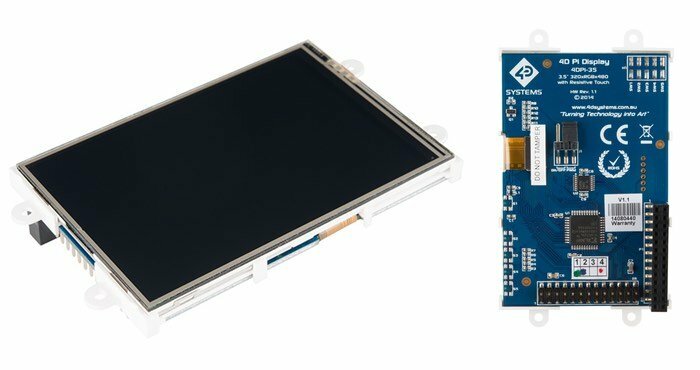 PaPiRus is an ePaper or eInk screen HAT module that has been specifically designed for the Raspberry Pi with screen sizes ranging from small – 1.44″ to large – 2.7″ in size and prices ranging from £30 – £65 respectively, depending on the size of display you opt for. 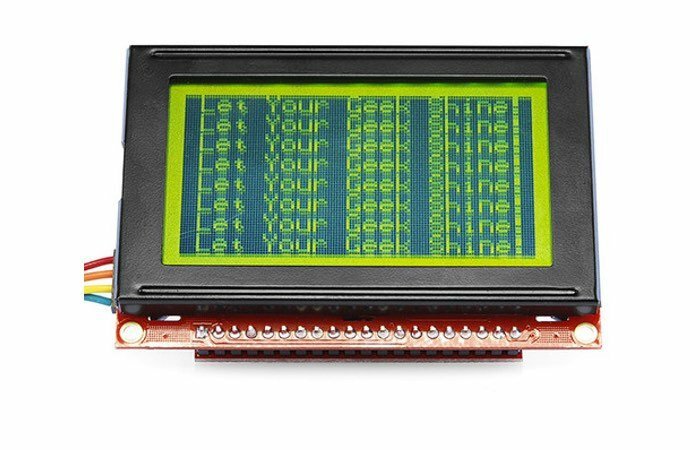 This high contrast Raspberry Pi display makes it easy to read anything printed to the screen in full sunlight and makes it prefect as a display for Raspberry Pi data-logging applications or any other ultra-low power application that require a small screen. The displays used in the PaPiRus were originally designed for use as small dynamic signage, to display product pricing in grocery stores, and are available in three different sizes : small measuring 1.44 inch, medium at 2.0 inch and Large measuring 2.7 inches. The smallest display measuring 1.44 inches diagonal across and sports a resolution of 128 x 96 pixels. One of the other great features of the PaPiRus is that the screen does not require any power to continually display an image, allowing it to stay on the screen without any power consumption, and then slowly fading away over the space of a few days. The PaPiRus Raspberry Pi display HAT is now available to purchase priced at from £30 depending on the size you require from the Pi Supply website. Moving on to the first full colour Raspberry Pi display, the small 1.8 inch 18-bit Colour TFT Shield comes equipped with both a microSD and a handy 5 way navigation joystick to add extra functionality to your Raspberry Pi project. Created by Adafruit the small display can be powered by a small portable battery if required and offers users a resolution of 128 x 160 pixels and a full 18-bit colour display. 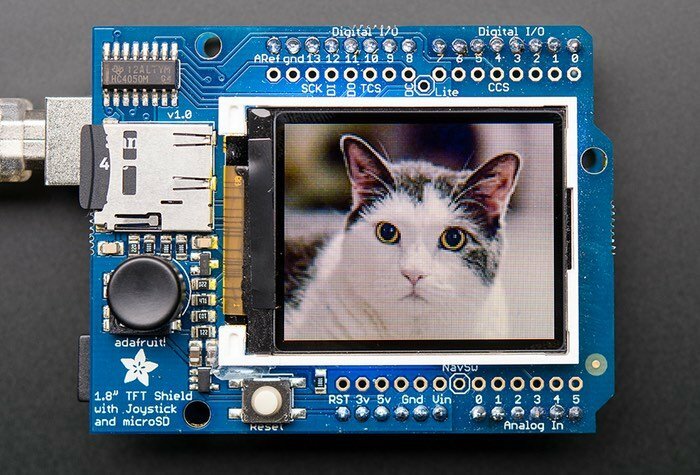 The Raspberry Pi 18-bit Colour TFT Shield is now available to purchase from a wide variety of Adafruit stockists as well as the official Adafruit online store and is priced at around £32. For more information and to purchase jump over to the Pimoroni or Adafruit website. If you are looking for a slightly larger screen measuring 2.2 inches across the diagonal and do not require a joystick or SD card adapter you might be interested in the Adafruit 2.2 PiTFT Raspberry Pi Display HAT Mini Kit. 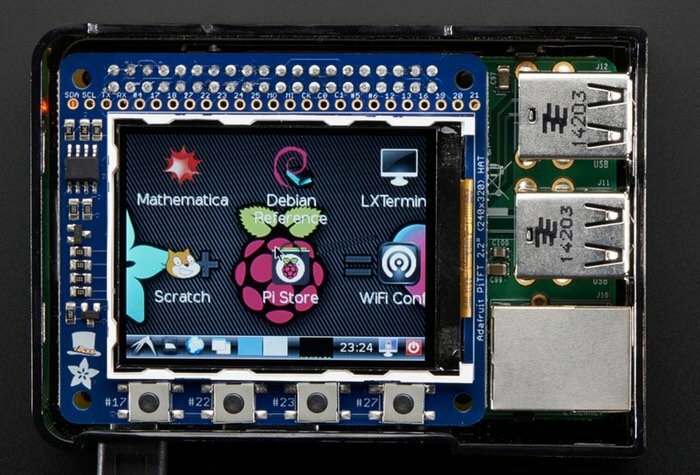 This Pi display is priced at around $25 and includes four buttons but no touchscreen support. The display offers users a resolution of 320 x 240 pixels and measures 55mm x 40mm. Once fitted the display uses the Raspberry Pi’s SPI pins SCK, MOSI, MISO, CE0, CE1 together with GPIO #25. For more information on the 2.2 inch PiTFT Raspberry Pi Display HAT Mini Kit without touchscreen support jump over to the Adafruit website for details and to purchase. Slightly larger again is the Adafruit 2.4″ PiTFT Raspberry Pi Display HAT that does also provide touchscreen support. The Adafruit 2.4 PiTFT display fits on to the Raspberry Pi Model A+, B+, Pi 2 and more the recently launched Pi 3 mini PC unveiled in February 2016. It offers a resolution of 320 x 240 pixels and again uses the SPI pins (SCK, MOSI, MISO, CE0, CE1) as well as GPIO #25 together with #24. But does provide 5 spots for the addition of slim tactile switches that can be connected to 5 GPIOs to expand the functionality of your project a little further if needed. For more information on the 2.4″ PiTFT Raspberry Pi Display HAT Mini Kit with touchscreen support jump over to the Adafruit website for details and purchase options. 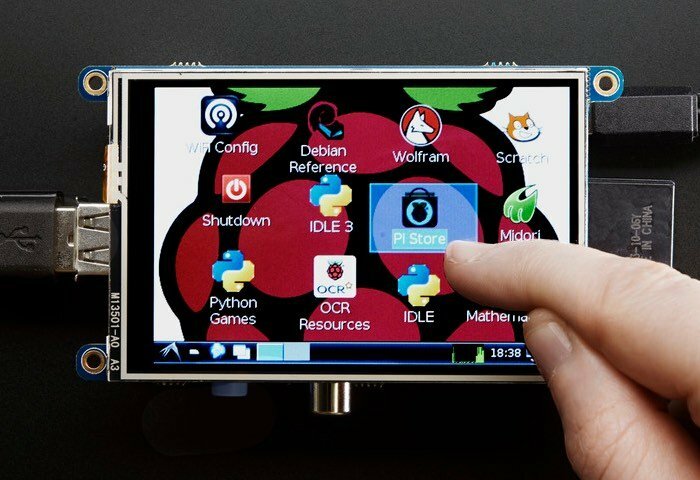 If you are looking for a slightly higher resolution display then the PiTFT 3.5 inch Raspberry Pi display that requires no soldering and offers a resolution of 480 x 320 pixels with touchscreen support might be worth more investigation. The 3.5″ TFT display is equipped with a backlight on which the brightness can be controlled if required and the current draw is 100mA with the backlight full-on. At 3.5 inches the Sparkfun Raspberry Pi Primary Display Cape has been specifically designed to work with the official Raspbian Raspberry Pi operating system and offers primary display support. This QVGA display provides a resolution of 480 x 320 and offers RGB 65K true to life colours with integrated 4-wire Resistive Touch Panel. The Pi display id powered directly from the Raspberry Pi and interfaces with it using a high speed 48Mhz SPI connection and is fitted with an on-board processor to provide direct command interpretation and SPI communication compression offering 17 frames per second (FPS). 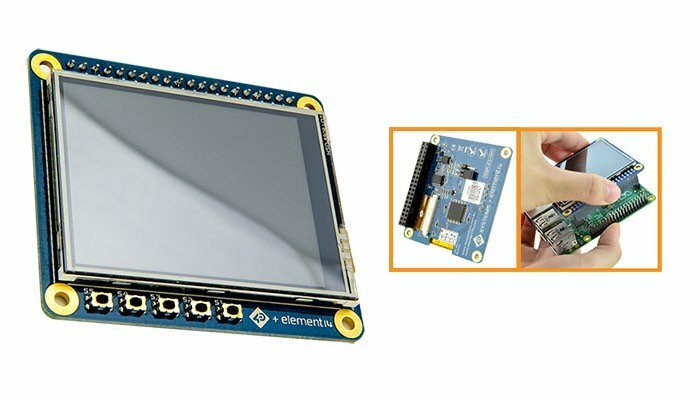 For more information on the 3.5″ Touchscreen Raspberry Pi Primary Display Cape jump over to the official Sparkfun website where it is available to purchase price that $75. The display also comes equipped with a uLCD-32PTU Display Module and a 4D Serial Pi Adaptor Shield as well as a handy 2GB microSD card reader and uUSB-PA5 programming adaptor.. For more information on this Raspberry Pi display jump over to the Robot Shop website for details. 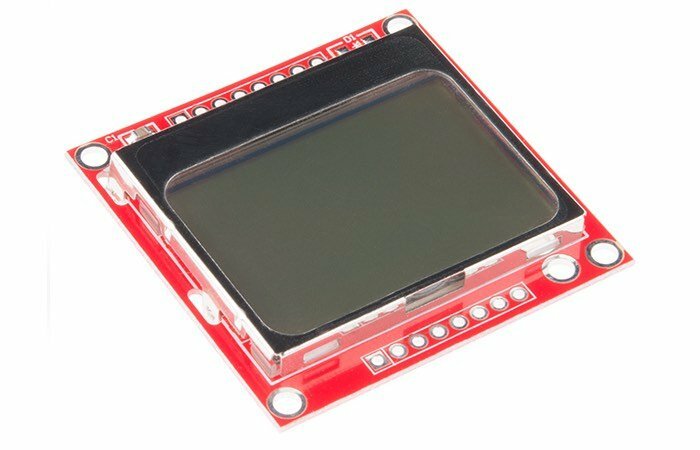 The 4DPi-24-HAT features an integrated resistive touch panel and offers users a 2.4 inch display that provides a resolution of 320 x 240 pixels and acts as a Primary Display HAT. Enabling the Raspberry Pi to display the primary output that would normally be sent to the composite or HDMI connected display. 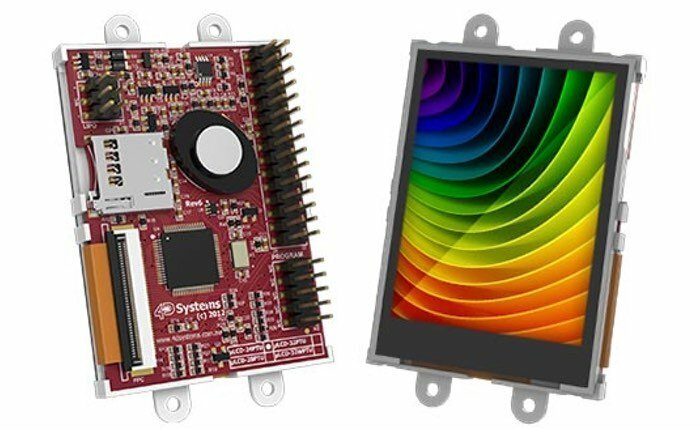 Communication between the Raspberry Pi and the 4DPi-24-HAT is providing by a 48MHz SPI connection thanks to the on-board processor for direct command interpretation and SPI the same as the Sparkfun 3.5″ Touchscreen Raspberry Pi Primary Display Cape. The display is compatible with Raspberry Pi A+, B+, Pi 2 and Raspberry Pi 3 mini PCs and offers a viewing area of 36.72 x 74.75mm and is both RoHS and CE compliant. 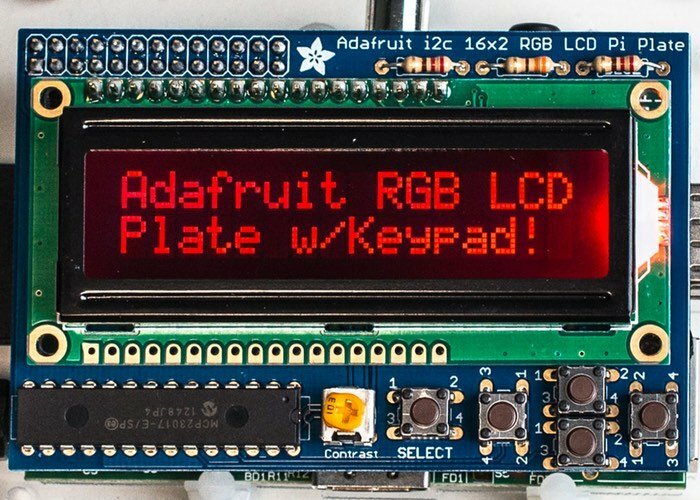 If you are in need of a more basic display that just provides two lines of text that can be scrolled if needed or used to display small amounts of data from your Raspberry Pi then you may be interested in the Adafruit RGB Negative 16×2 LCD+Keypad Kit. This screen for the Raspberry Pi is about as basic as they come and may already be familiar to those that have used Arduino development boards and Shields previously. – Extra-tall 26-pin GPIO header so the plate sits above USB and Ethernet jacks. The LCD and Keypad Kit is available to purchase for around $20-$25 and is available in both positive and negative versions from sites such as the Pimoroni online store and Adafruit. If you need a slightly large screen and fancy a little more upto date technology in the form of an OLED display for your Raspberry Pi then the Adafruit Monochrome 128 x 32 I2C OLED graphic display, maybe worth more investigation. 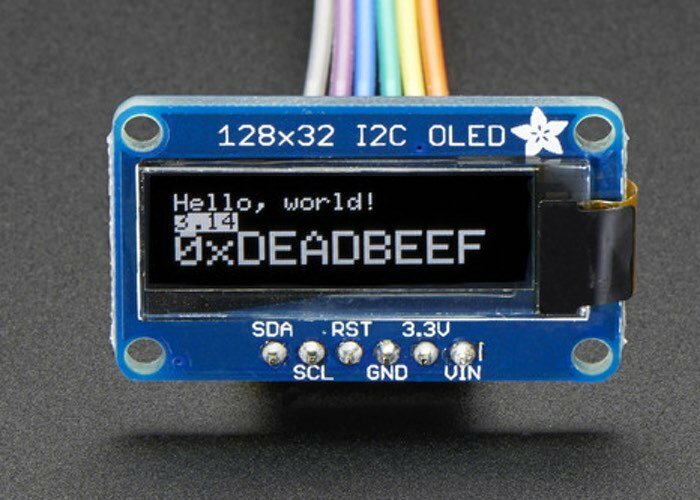 The I2C OLED is available to purchase for around £16 and is also available from the Adafruit website. Along the same theme but again offering more screen real-estate is the SparkFun Serial Graphic LCD Raspberry Pi Display which offers a 128 x 64 pixel Graphic LCD and provides the user with a simple serial interface and a full range of controls. 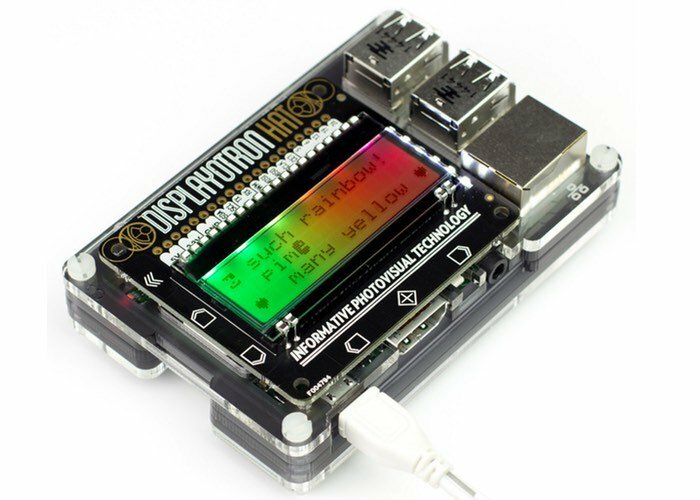 The Serial Graphic LCD Raspberry Pi Display is available to purchase from the Sparkfun online website priced at £27 or $36.95 and requires a 220mA draw for the backlight to be fully illuminated. Other Raspberry Pi display boards worth consideration for your project include the Raspberry Pi Display-O-Tron HAT which is now in its second generation of development and is fitted with six capacitive touch input buttons around its edge. Other features of the Display-O-Tron HAT include a six-zone RGB backlight, LCD display offering 16×3 characters, GPIO breakout pins for 5V, 3V3, GND, SDA/SCL, TX/RX, PWM, MOSI/MISO/SCLK/CE1, as well as GPIO #5, #6, #13, #19, #26 with support for full ASCII set plus eight custom characters and a useful 6 element LED bar graph function. The super slim 16×3 character LCD display is now available from the PiHut website and is priced at £22 and can add a splash of colour to your project without a massive power consumption issue. Normally the Nokia LCD comes with a PCD8544 as pictured above, that interfaces with micro-controllers via the serial bus interface and offers a low power CMOS controller/driver, providing users with 48 rows to play with and 84 columns. All functions for the display are provided via a single chip that provides on-chip generation of the LCD’s power supply and bias voltages all in one compact unit, removing the need for any further components. If you already have a small screen and would like to add touchscreen support to your project without swapping the display, a handy little add-on screen in the form of the Nintendo DS Touch Screen will, help you accomplish this. Although its not a Raspberry Pi HAT or Shield, it is a useful and affordable way to add interactivity to a project. Hopefully this list of Pi displays has helped figure out which would be best for your next project, I will endeavour to try and keep this list updated as new Raspberry Pi display Shields and HATs are released, but if I have missed any that is worth a mention please do not hesitate to drop in a link in to the comments below. If you are interested in larger displays that have been specifically created for the Raspberry Pi and are connected to the mini PC via HDMI rather than being a HAT or Shield. I will soon be compiling a list of the most popular larger Raspberry Pi displays currently available and will provide a link here once it’s live, so please bookmark and return soon or subscribe to our feed to be updated.